School Visits, MAKEUP reviews and a Contest!! Without going into gory details, I was involved in a car accident a few weeks ago. No one was seriously hurt, although our van is a dead duck. As for me, my chest and back were very sore, and I was moving as slowly as a centenarian. Albeit a cute centurian with highlights. That said, I'm back to my normal spry, cheerful self. However, the car accident made me Stop And Evaluate Life. I'm always on the lookout for Life Lessons (just ask my children), and I came away from this experience with a few. Here they are, in order of least to most important. 1. People with really bad eyesight (like myself) should always own a decent pair of back-up glasses. Apparently, my purse was unzipped, and, at the moment of impact, my glasses flew out and buried themselves on the floor of the van amongst all kinds of debris such as a large diet coke with extra ice, two tacos, a notebook with book ideas, kleenex, a deck of cards about space trivia and a million pens. I didn't notice, which meant I spent the evening in the ER wearing large, blingy perscription sunglasses. To the nurse who asked me my profession, I was kidding when I answered, "Jazz Musician." 2. I am a horrible patient. Quite possibly, Mr. Summy could have attested to this several times over during our twenty-three years of marriage. He has, however, wisely kept quiet on this front. Even that night in the ER, when I kept repeating, "I can't believe what a horrible patient I am. I'm hating every single second of being here. Who knew I'd be so grumpy and furious?" he merely blinked and smiled and kept his counsel. The whole time I was there, I just wanted to walk out. I did not like answering personal questions. I especially did not like answering personal questions in a crowded hallway. I did not like waiting three hours for an x-ray. I lay, staring at the ceiling, and seethed. And seethed. And seethed. Until I ran out of seething energy and decided that I needed a concrete plan for avoiding hospital stays. So, it's back to the gym on a VERY regular basis. And back to more healthy eating. And back to a simpler lifestyle where I'm not racing around like a chicken with her hairlighted head chopped off and where I learn to say "N.O. spells NO." I have much control over the first two issues, but less over the third. Still, I'm determined to slow down. And look at this! 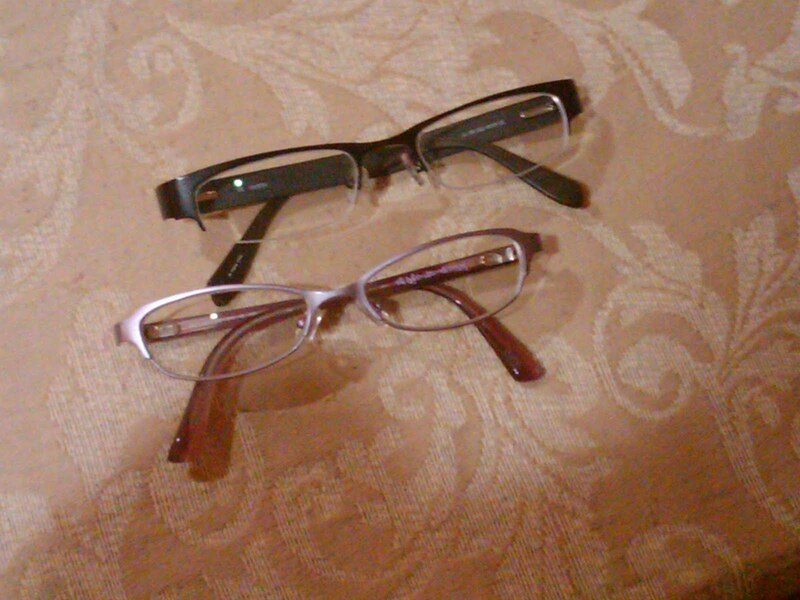 I've already got two new pair of glasses! And a new car! 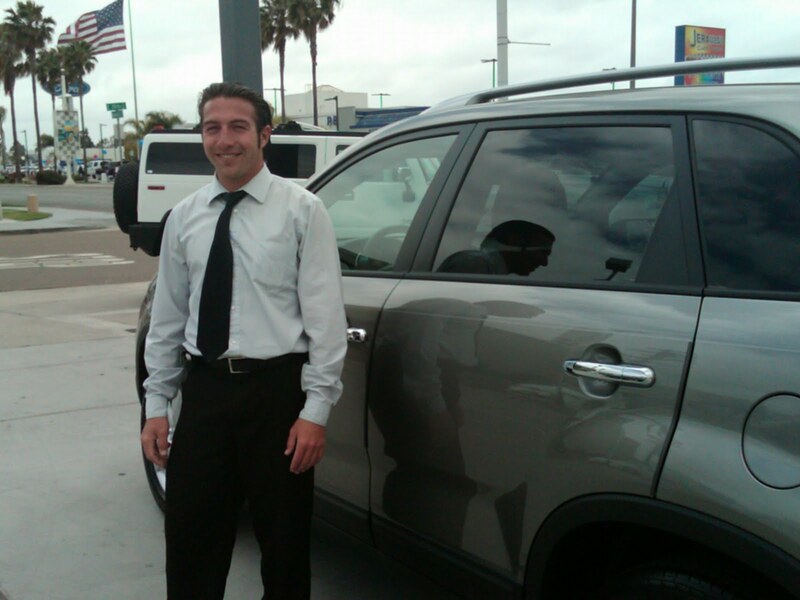 This salesguy, Michael Hooper at Ball Kia in National City, is so the best! For those who are interested, it's a Kia Sorento. Microwaved mac and cheese . . . when no water is added! Child #3, what were you thinking? And guess what? I'm guest-blogging again! Today I'm over at Adventures in Children's Publishing talking about getting published. Just your run-of-the-mill post. Or not. Mwahahaha! 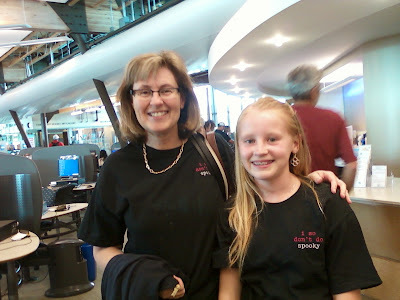 You might remember last summer I met this really talented, brilliant, lively going-into-7th-grader-girl named Cassandra when I was at the Encinitas Library for an author panel. Since then, Cassandra has started a blog and a teen writing club that meets regularly at the library. I know, she's quite amazing. Oh yeah, and she contributes to our Book Review Club. Anyway...she invited me to be a guest at the teen writing club! So, I climbed into my car and headed north up the highway. It was so much fun! I got to hang out with more creative and talented teen girls. The group (in alpha order) is: Analisa, Carina, Cassandra (Fearless Leader), Katie, Laura, and Lilly. Remember these names! You'll be looking for them in the bookstore one of these days. What a blast! These interesting and articulate girls range from 4th through 7th grade. They don't all attend the same school, but responded to Cassandra's library flyer about starting a teen writing group. They are chockful of creative ideas and chattiness and support for each other's writing. Incredible! Fingers crossed they invite me back. 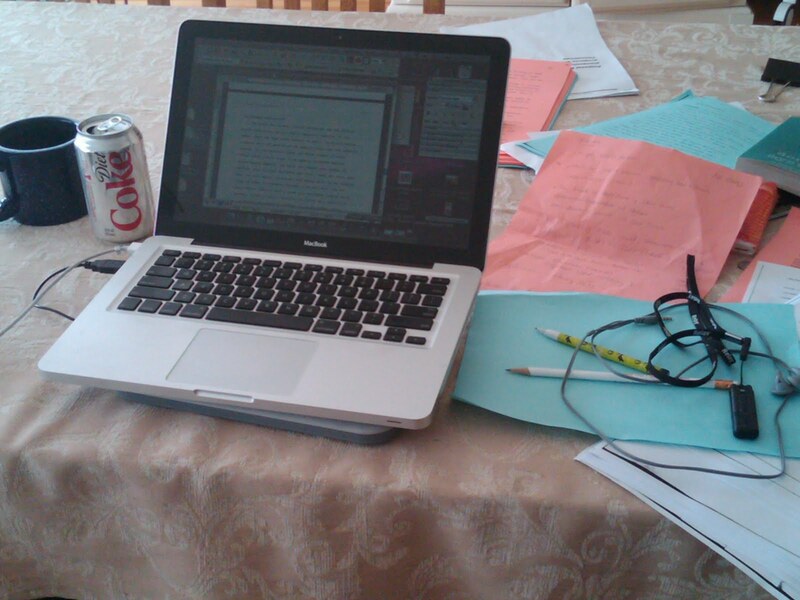 AND...If you have even the slightest interest in writing a series, click over to the Through the Tollbooth blog where the wonderful Stephanie Greene has a week's worth of posts on the subject. Here's a link to my guest post. AND...I guestblogged over at Teen Reads about questions I get asked at school visits. Thank you so much for having me! 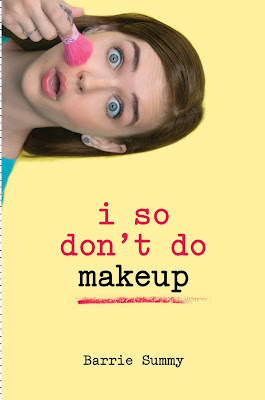 BTW, this is a different post about school visits than the one I wrote for The Divining Wand where I notice Larramie is offering a FREE copy of I SO DON'T DO MAKEUP until Wednesday, May 26 to a commenter. I should be back to regular My Town Monday posts next week when we'll be changing things up a bit! In the meantime, check out what these My Town Mondayers have to say. I turned in the revisions for I SO DON'T DO FAMOUS. Today. On time. Yay. Oddly enough, my elbows are sore. Child #4 was particularly happy. "Now you'll have more time to spend with me!" She was a little less thrilled when I brought out the math homework! And, just so that you know I'm not all work and no play, the two of us went out to dinner (the boys were all at various activities involving pools). I've also been skipping around cyberspace, guest blogging! Here's a fun post at the Teens Read Too Book Club. They provided some of the questions, and I, uh, tossed in a few of my own. ;) And the stuff about the parent-teacher interview when I was in kindergarten is true. 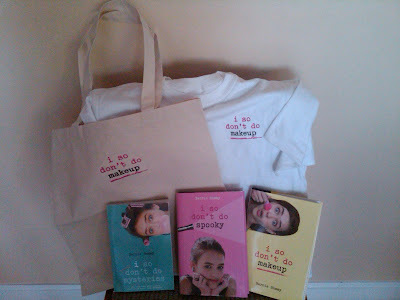 Also....there's a chance to win a free copy of I SO DON'T DO MAKEUP. All in all, I'm VERY glad to have the revisions in. I'm looking forward to catching up on blog reading, book reading, the gym, and sleep. 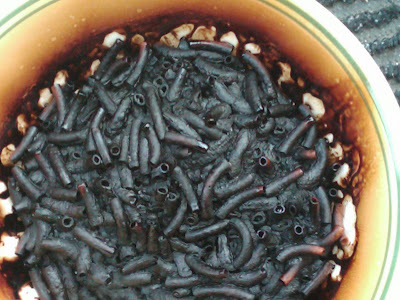 My family hopes I return to cooking, cleaning and laundry. Ha! Today, I'm guest posting over at The Divining Wand about weird and wonderful questions I've been asked at school visits! 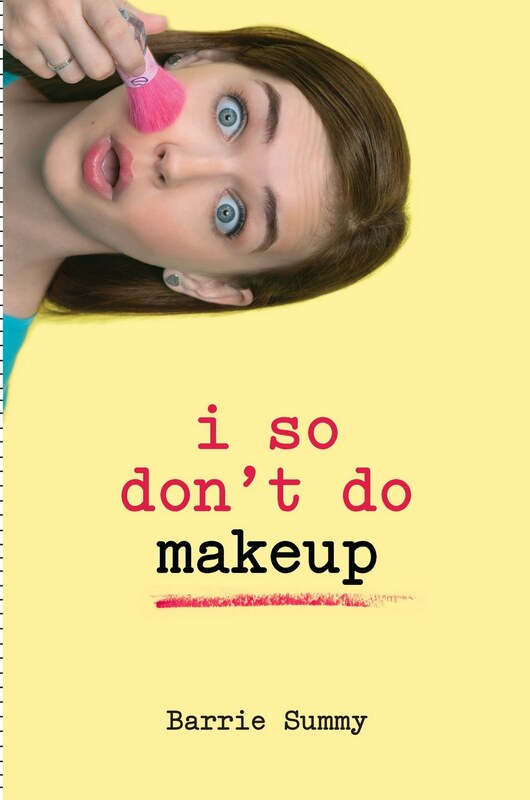 Thank you to the following blogs for lovely reviews of I SO DON'T DO MAKEUP: Carrie's YA Book Shelf, Library Lounge Lizard and YA Book Central! (note: no apostrophe!) with the subject line "Pick Me!" In the body of the email, include your name and email address (if you're under 13, submit a parent's name and email address). One entry per person and prizes will only be shipped to US or Canadian addresses. Entries must be received by midnight (PDT) on June 30. Winners will be selected in a random drawing on July 1 and notified via email. Check back here after July 6 for the list of winners! I SO DON'T DO MAKEUP is out! My friend and critique partner, Kelly Hayes, has been bitten by the bloggng bug! In fact, I'm starting to wonder if she might not get her own blog going one of these days! in the meantime, she's back today with a My Town Monday post on Muffler Men. So, uh, Kelly, take it away! If you’ve been on an American road trip in the last few decades you’ve probably seen one. And if your town has one you’ll know instantly what I’m talking about. They stand about 20 ft high and they’re made out of fiberglass. They might sport a full beard, a worker’s cap or a cowboy hat. They might be an Indian, a lumberjack, or, strangely, an Alfred E. Neumann lookalike called the Happy Halfwit. But the one characteristic they all share is that they were made to hold something in their hands: A muffler, a tire, a golf club, a pitchfork, even a giant hotdog. Muffler Men were created in the sixties by International Fiberglass of Venice, CA. The company took a Paul Bunyan mold originally used for a PB café on Route 66 in Flagstaff, AZ in about 1962 and turned it into a unique roadside industry. The business grew and the company turned out chickens, steers, horses, and even a woman, Miss Uniroyal. Looking suspiciously like Jackie O, these female versions of the original wore bikinis, and some even came with a removable dress. So much for equal rights. 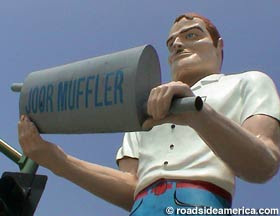 Sadly, over the years, hundreds of Muffler Men have been destroyed, but many still stand proudly, if a little intensely, on roadsides across America. Escondido, the town where I live, has an M-man. He stands proudly on his concrete block on the corner of Juniper and Valley Parkway, where he has served as the mascot of Joor Muffler Service for the last forty years. He’s a pretty traditional model, with a white shirt, a pencil mustache, and the ubiquitous lantern jaw. At Christmastime he sports a Santa suit and dresses as a pumpkin for Halloween. I’ve heard that he was being fitted for a Hawaiian shirt, but I’ve never seen it. Although he’s been the victim of a few pranks over the years, we here in Escondido generally appreciate him. While many people have tampered with the original models, adding pirate gear, Viking helmets, welder’s masks, etc., there have also been recent mutations made by fiberglass companies. One example is a Frankenstein’s monster at a Burbank miniature golf course. Call me a purist, but I prefer the originals. They’re giant souvenirs of a bygone era, one where business owners had to be creative to attract customers. They remind us of a time when chain stores were a rarity and most American towns still had plenty of individual flare. 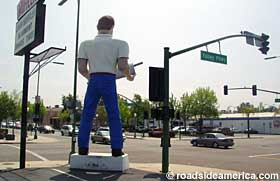 If you want to do a little Muffler Man spotting yourself, a good website to check out is roadsideamerica.com. Who knows, you might just see one of these fiberglass giants on your next road trip. Please check out posts by the other My Town Monday participants by clicking here. And thank you, Kelly! Very interesting! Aaahhh. Doesn't it feel good to slow down for a moment during this busy, busy spring and pick up a book? Not only does it feel good, it's good for you. So, grab a chair and a coffee and a chocolate chip cookie (invented by accident in 1933!) and delve into the books below. Happy Reading! 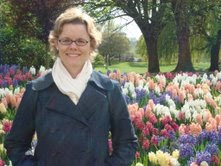 Kelly Hayes, one of my wonderful Denny's Chicks critique partners, has written enough reviews for The Book Review Club that I probably don't have to introduce her! In a weird coincidence, Kelly actually reviewed for May 2009! Anyway, we LOVE her reviews! They are always thoughtful and insightful and well written. I think you'll enjoy this month's. Mary Gooch is a woman who has recently topped out at 302 pounds and has worn a path from her bed to the refrigerator. She always told herself that if she ever hit three hundred she’d kill herself, but like so many things in Mary’s life, that never happened. From the first few pages, it’s obvious that Mary has given up on herself. And as her 25th wedding anniversary approaches, we find out her husband, Gooch has given up on her too. He’s left her and given her no real clue about where he’s gone. All she knows is that he’s deposited a large sum of money for her in their bank account, but she doesn’t even know where the money’s come from. Mary’s first impulse is to wait for Gooch to come back and in the meantime eat herself into a stupor. There’s even one wrenching bit where she resorts to gnawing on frozen corn to feed her loneliness and fear. But this kind of dark inertia proves too much even for Mary. She begins the process of tracking down her husband, which takes her from her small Ontario town to Toronto, and then to Los Angeles, where Gooch’s mother lives. There she waits again for Gooch to turn up. And it’s there that her true journey begins and we get a look inside at the pain and disappointment that have made Mary what she is. But this is not a story about a woman tracking down her husband and the happy reunion that ensues. It’s about a woman finding herself, under all the extra pounds and the fear and the self-loathing. It’s about waking up from the long cold numbness of depression. If this book were written by a different author it might be a saccharine tale about an obese woman losing a bunch of weight, finding her true thin self, and conquering the world. That would be Hollywood’s version. But in Lansen’s hands it’s a compassionate, honest, realistic story of an unhappy woman at a huge turning point in her life. Does she stay in bed and let the world crush her? Or does she get up and, as her father always said, “take a drink from the hose and push on”? Granted, this book is not for everyone. I think you are either carried away by Mary Gooch’s sympathetic, funny, heart-wrenching voice or you’re not. I was. I took the journey with her to the end and felt like I’d picked up something valuable along the way. 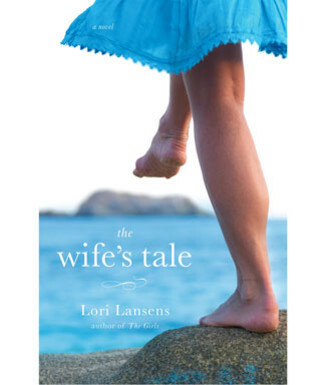 If you liked The Memory of Running by Ron McLarty, you’ll like The Wife’s Tale. These two books have similar main characters starting on personal journeys after hitting rock-bottom. These are not “larger-than-life heroes.” They’re ordinary people with big problems who push through to find what’s on the other side. And it’s something we can all recognize. And now, drum roll, onto the amazing reviews from amazing reviewers!! Welcome to another My Town Monday post! -This is the world's largest outdoor musical instrument. -The organ weighs almost 100,000 pounds and has over 4,500 pipes. Some are 32 feet high, while others are the size of a pencil. A super huge rollaway door, weighing over 20,000 pounds) protects the organ from weather when not in use. -There will be a special Mother's Day program this coming Sunday. 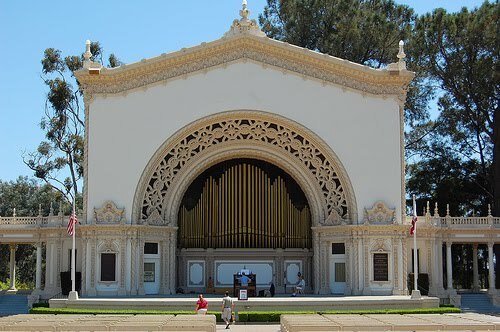 -San Diego has had a civic organist since 1917 to perform the Sunday concerts. Dr. Carol Williams is our current civic organist.